Now’s a great time to get your decorating projects finished. 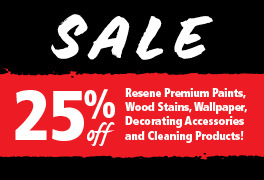 Get 25% off Resene premium paints, wood stains, primers and sealers, wallpaper, decorating accessories and cleaning products! Offer available at Resene owned ColorShops and resellers (NZ only) from 6 March to 23 April 2019. Paint offers also available at participating Mitre 10 MEGA and Mitre 10 stores. Plus for Resene DIY Cardholders, spend $750 or more in one visit and enjoy an extra discount. Sign up for a Resene DIY card free in store or online. Find your nearest ColorShop or reseller.